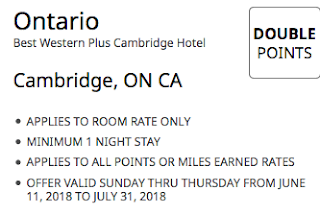 Rewards Canada: June 14 Update: 7-Eleven 7Rewards to implement 90 day inactivity rule, Double Points at the Best Western Cambridge and more! June 14 Update: 7-Eleven 7Rewards to implement 90 day inactivity rule, Double Points at the Best Western Cambridge and more! Further to our feature of "Expiry and Inactivity Rules of Canadian Loyalty Programs" Rewards Canada reader Adam B. advised us that 7-Eleven 7Rewards points will expire after 90 days of inactivity as of July 6. That's one of the shortest periods we are aware of for a Canadian program (Spriit Airlines in the US is 90 days). At least with 7-Eleven it is pretty easy to earn or redeem. Find out more here. IHG Rewards Club Buy Points Flash Sale - 100% bonus for the next 3 days! Save up to 15 % on Marriott stays in Canada! Book at a participating hotel by July 1, 2018 for stays until July 31, 2018 and save up to 10% on best available rates! Marriott Rewards® Members save up to 5% more. Find out more here. Receive a $100 CAD resort credit each night of your stay at the Kananaskis Mountain Lodge. Book by Jun 30 for stays until Jul 31, 18 Find out more here.